The game board is a hexagon with five exhibit areas (Agriculture, Electricity, Fine Arts, Manufacturing, and Transportation) surrounding the famous Ferris wheel. On each player’s turn, they place supporter cubes in an exhibit area and collect the cards there. 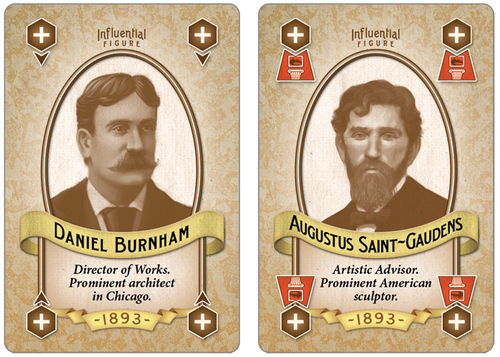 Those cards may be proposed exhibits (playable at the end of the round), midway tickets (which move the Ferris wheel car), or influential people (granting extra supporters on the next turn). The round ends when the Ferris wheel car returns to the starting point, and scoring begins. After three rounds, the game ends – and the more variety you have in “approved exhibits”, the higher your score (reputation). Whoever has the highest reputation wins! We loved this game. The artwork is beautiful, the cards are detailed, and the mechanics are relatively simple once we had played a few turns. We quickly got used to the idea of drawing “from the board” and restocking, rather than drawing from a deck. There’s a great balance to this game – you could concentrate on one area to lock other players out, spread yourself thin to try to approve more exhibits and risk getting knocked out of some areas completely, or you could simply grab midway tickets to move the Ferris wheel around before your fellow players can consolidate their own holdings. I think the best strategy is to do a little bit of everything. World’s Fair allows for plenty of competition, but also rewards second-place finishes, so it mostly avoids winner-take-all, cut-throat game play. Foxtrot Games recommends this game for ages 10+, which sounds about right, although in our family we would skew a bit younger and let our 7-year-old play, too. If you have a child who “gets” strategy, they will enjoy this game – and learn some history while they’re playing it! 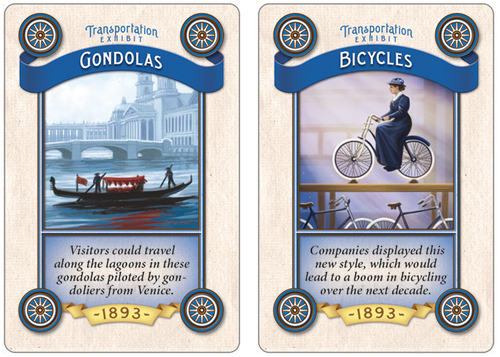 Check out the Kickstarter campaign for World’s Fair 1893. The Family Gamers received a prototype copy of World’s Fair 1893 from Foxtrot Games for review.